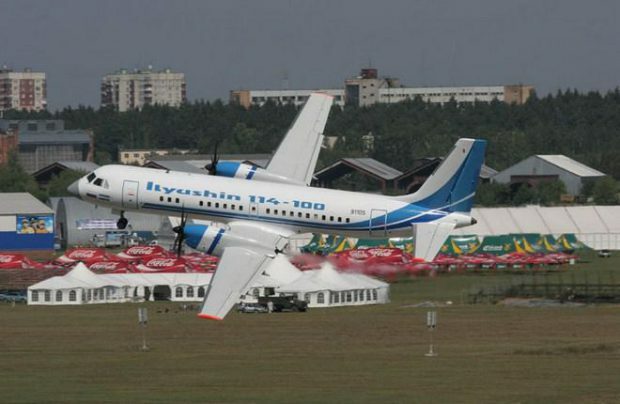 Production of the Ilyushin Il-114 regional turboprop aircraft will be restored in Russia in Lukhovitsy, a town located just outside Moscow, Yuri Slyusar, president of the United Aircraft Corporation (UAC), announced last week. The aircraft assembly will be carried out at the local MiG plant, an UAC subsidiary. The first Il-114-300 prototype is planned to be built in 2018. Deliveries of completely Russian-produced types of such aircraft are expected to begin in 2021. “We are preparing for the launch of production of the Il-114, here in Lukhovitsy. … the resources are being distributed. Design documentation is being prepared for transfer to the assembly facility,” said Slyusar. According to him, the facility should reach the production rate of 12 per year in 2022. In the coming decade, the corporation expects to produce up to 100 of such aircraft. Slyusar said that UAC is currently in talks with Uzbekistan concerning eight Il-114 fuselages which remain at the factory in Tashkent, although the production in Russia will, most likely, be started from scratch. The UAC says that the aircraft will be fit with a more powerful TV7-117ST engine, starting from 2023. This new powerplant is now being developed for the new Il-112V light military transport aircraft. The Il-114 could serve as a platform for reconnaissance and other special missions aircraft, told Slyusar. Il-114 will be produced at the same location as MiG-29 and MiG-35 combat aircraft. The assembly workshop in Lukhovitsy was earlier supposed to manufacture the aircraft components while the final assembly was planned to set up in another MiG facility in Nizhny Novgorod. The workshop in Lukhovitsy will have an assembly capacity of at least 12 aircraft per year. It has the ability to accommodate two Il-114s in the assembly line while not disrupting the production of military jets. Other UAC subsidiaries and suppliers, including Aviastar-SP, VASO and Gidromash had also planned to take part in the Il-114 production. The program’s cost is estimated at 55 billion rubles ($917.3 million), part of which is to be compensated by Russia’s oil revenues.